One of my favorite Thanksgiving traditions growing up was traveling to my grandparents house for the holidays. We normally traveled to my mom’s parents the weekend before Thanksgiving and my dad’s parents the day of Thanksgiving. I have some wonderful memories around the holidays at both of my grandparents houses and I’m so grateful to be able to pass that on to my children. We normally make the 3 hour trip to my in-laws the weekend after Thanksgiving and there isn’t much in the way of eating on the way. That’s why I love to make portable recipes that are filling and can be packed and eaten in the car. 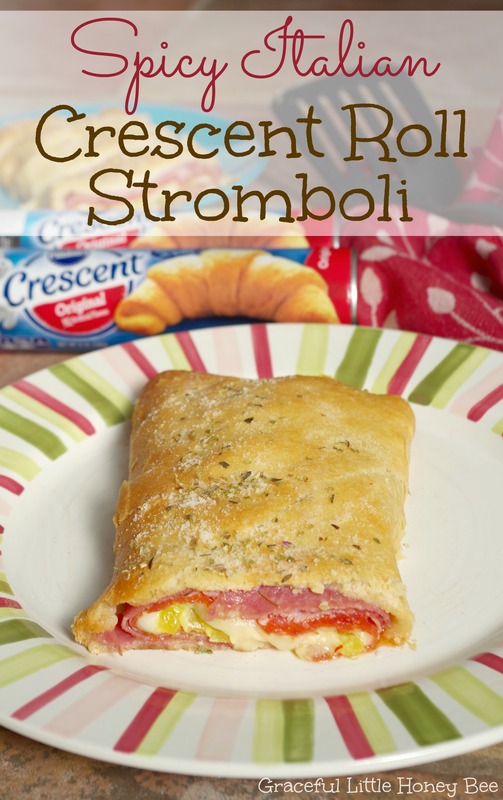 This easy to make Spicy Italian Crescent Roll Stromboli uses Pillsbury Crescents® so it’s a snap to put together. After it’s cooked you can cut it into slices and pack for an easy meal on the go. It’s good hot or cold so you don’t have to worry about heating it up on the road. With all the baking and cooking that comes with the holidays, it’s nice to know that Pillsbury® offers delicious ready to bake doughs that help me keep my Thanksgiving traditions alive. 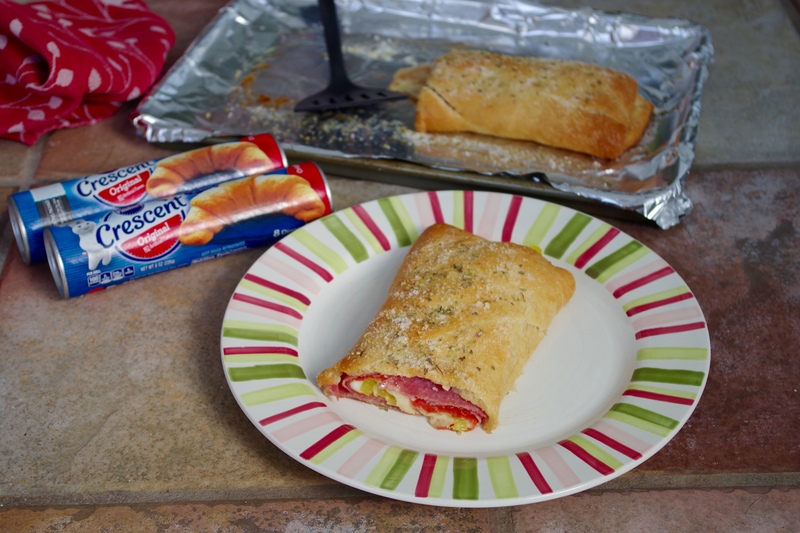 I love that I can put together such a warm and filling meal with help of Pillsbury Crescents®. I purchased these rolls in the refrigerated section at Wal-Mart. Step 2: Line baking tray with foil. Grease with cooking spray. Step 3: Roll crescent dough out and press together perforated edges. Step 4: Layer all ingredients on dough. Step 5: Roll lengthwise and bake for 15-17 minutes or until golden brown. 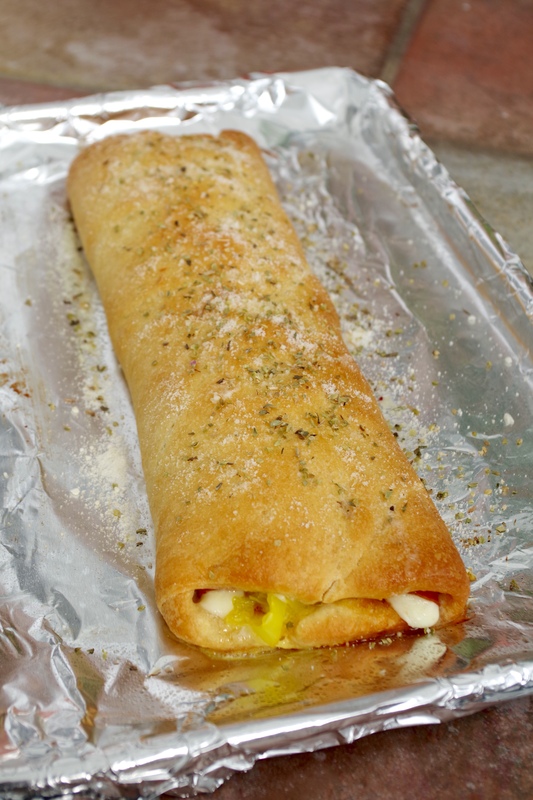 OPTIONAL: Drizzle with melted butter, then sprinkle with parmesan cheese and dried oregano. Slice in desired length and serve. Enjoy! Line baking tray with foil. Grease with cooking spray. Roll crescent dough out and press together perforated edges. Layer all ingredients on dough. Roll lengthwise and bake for 15-17 minutes or until golden brown. What is your favorite Thanksgiving tradition? I’d love to know! Visit Pillsbury® at Wal-Mart for more recipes and #warmtraditions!